The dismantling of "Understanding Canada"-an international program eliminated by Canada's Conservative government in 2012-posed a tremendous potential setback for Canadianists. Yet Canadian writers continue to be celebrated globally by popular and academic audiences alike. Twenty scholars speak to the government's diplomatic and economic about-face and its implications for representations of Canadian writing within and outside Canada's borders. The contributors to this volume remind us of the obstacles facing transnational intellectual exchange, but also salute scholars' persistence despite these obstacles. 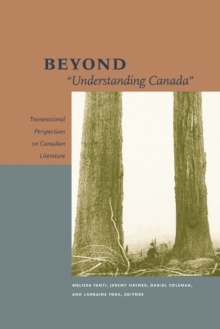 Beyond "Understanding Canada" is a timely, trenchant volume for students and scholars of Canadian literature and anyone seeking to understand how Canadian literature circulates in a transnational world.